If you are new to sports wagering or simply looking to learn more about certain phrases and terminology, here you will find some common sports betting terms and definitions. 'Against the spread' refers to a team or player's usually recent or longer history (record) of covering the odds (spread bet) when listed as favorite or underdog. Example: the Grizzlies are 7-1 ATS in their last 8 after scoring 100+ points in their previous game. An establishment that accepts wagers on the outcome of horse racing and sporting events. Also commonly referred to as a bookie (person), bookmaker or sportsbook. Buy Points means that you can move the point spread so that you give away fewer points with the favorite or get more points with the underdog, for both american football and basketball. To do this you must pay an extra 10% for each ½ point you buy in your favor. For NFL football and NCAA football, you would pay an additional 15% to buy on or off of 3 points - also know as Key Points. And if you buy through 3 points, you would pay an additional 20%. NOTE: There are usually no Key Points for basketball. You would pay a flat 10% for each 1/2 point you buy. An example of how to buy off of 3 points: the Baltimore Ravens (-3) are 3 point favorites. To buy 1/2 point and make them a 2.5 point favorite, you would need to lay 125 to win 100. Mainly used in hockey, which has a split-goal line e.g. - Philadelphia Flyers (1 - 1 ½) favorite over the LA Kings as opposed to goal spread plus moneyline (-1/2 -180). Odds posted on the winners of various major sport championships in advance of the event, including the Super Bowl for NFL Football, the World Series for Major League Baseball, the Stanley Cup for NHL Hockey, the NBA Championship for NBA Basketball, and the World Cup for international soccer betting. The sum of all wagers collected for a particular event or over a specific time period by a bookmaker. Another name for vigorish, or the tax that a bookmaker charges for each wager. Some books may offer 'no juice' or free sports betting offers as incentives for potential bettors to join their company. The listed odds on a game (points or money line). To win both sides of the same betting proposition; betting the favorite team at -1.5 with one bookmaker and then taking +3.5 with another bookmaker; the game ends up with the favorite winning by exactly 3 points, you have then "middled the game". A moneyline is offered when no handicap is given, such as a point spread or run line, and the odds are not therefore fixed. Payouts are then based on true odds rather than fixed odds. The favorite and underdog are given odds to win a game or fight. The minus sign (e.g.-130) always indicates the favorite and the amount you must bet to win 100. The plus sign (e.g.+110) always indicates the underdog and the amount you win for every 100 bet. Therefore based on the above moneyline, you bet 130 to win 100 on the favorite. For the underdog, you win 110 for every 100 bet. The betting line which quite often appears in the daily newspapers. The lines are only approximate and are sometimes inaccurate and misleading. We recommend browsing a sports odds comparison for the most up-to-date odds in online sports betting. A horse, team, or individual so favored by the public that the odds are less than even. The line that the bookmaker uses for wagering purposes. The line which comes from Las Vegas is quite often referred to as the official line; however, the line that your bookie offers you is actually your "official line". 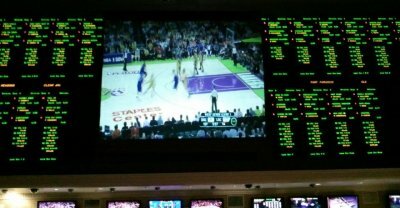 A wager that the total combined score by two teams will be more than the total posted by the sportsbook. A multi-part bet, usually involving three or more teams, in which each team in must win or the parlay loses. Payouts for parlay bets are are incrementally higher than for single wagers. Occasionally, there will be no favorite on a game. In this instance the game is said to be a pick and you can have a bet of 10/11 (bet 110 to win 100) on either team. For example - the Detroit Lions are 8 point favorites over the New York Giants (an 8 point spread shown as -8 beside Detroit on our NFL lines page). If the final score is Detroit 20, New York 13, then the actual game score "spread" is 7 points (20 minus 13). In our example, if you took New York (called the "dog"), you would win the bet since Detroit had to win by 9 points or more to "cover the spread". Detroit needed 2 more points to "cover" since if the game landed right on the "spread" of 8 points it would be called a "push" (similar in concept to a tie in Moneyline wagering, which is also called a push) and it would be "no action" (no bet and money held in your account to cover the wager is released back into your available balance). If the "spread" is put in at a half point (e.g. -8.5 for the favorite Detroit) by the sportsbook handicappers then there can be no "push". In this case, there is "action" at any final game score pointspread. In a pointspread, you must wager 11 to win 10 (21 is returned to the winner). 10/11 is the standard for pointspread bets on most sports. Hockey combines both a handicap/spread and odds. This is called the puck line. The favorites are the Detroit Red Wings, who are giving the Boston Bruins 1.5 goals. To win the bet, Detroit would have to win the game by 2 goals. When placing this bet you are getting even money, which means that for every 110 you wager, you will win 100. If you are betting on Boston, you will receive a 1.0 goal handicap, meaning that if Detroit wins by 1 goal the game is a push. If the game ends in a tie or Boston wins, then you win the bet. The odds again are at -110. If the result of a game lands exactly on the pointspread or is a tie in the case of betting a moneyline, or if the exact score of the game matches exactly the sportsbook's posted game total (Total), then the game is a "Push" or "No Action" and all wagers are normally released. A form of parlay betting in which we wager various combining team wagers. A three-team robin is team 1 to 2, 1 to 3, and 2 to 3. A four-team robin is team 1 to 2, 1 to 3, 1 to 4, 2 to 3, 2 to 4, and 3 to 4. Five-team, etc. A typical receipt of a wager or wagers placed at a land-based sportsbook. When a betting line starts to move quite rapidly. Most 'steam games' do not necessarily reflect the 'right side', but are games that the mass of bettors somehow decide to key on. A consecutive string - usually at least several - of winning bets. 'Straight up' refers to a team or player's history (or record) against an opponent regardless of odds or being favorite / underdog. Example: the Bears are a mere 4-12 against the spread in their last 16 off a SU win. Total combined point/runs/goals scored in a game; In baseball, if either of the two listed starting pitchers don't go the distance, the bet is automatically canceled. A bet that the total combined score for two teams will fall below a posted total. The house's commission on a wager. Formally known as 'vigorish'. Bet on sports at one of the internet's leading sports betting sites.